Denis Wood’s 2010 book Rethinking the Power of Maps includes a discussion of exhibits devoted to maps created by artists prior to 2010. A significant number of exhibits have opened since the book was published. Map Art Exhibitions, 2010-11 was posted in late 2012, and an update for 2012-13 is below. While we know there were more exhibitions than we cover here – so please note any we’ve overlooked in the comments – the last two years have marked a slackening of interest in map art as the genre is increasingly taken for granted. Map art is gradually seeping into art the way landscape painting did into the Western tradition in the fifteenth and sixteenth centuries, solidifying its position in the world of art as it loses its novelty. 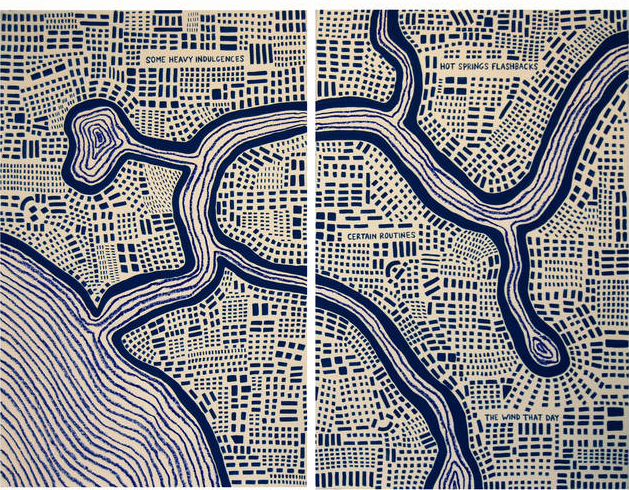 One thing this means is that map art is beginning to show up in broader bodies of work – as in Zarina Hasmi’s (above) or Erik Parker’s (below) – and in exhibitions on other themes – as in three of shows we’ve included here. Julia Penrose: from Mapping the Future: Where Are You Now? Mapping The Future: Where Are You Now? Textile Forum South West, Gallery at The Brewhouse Theatre & Arts Centre, Taunton, England, 2012. Following a successful Textiles Forum South West (TFSW) conference, Maps define the future: where are you now? 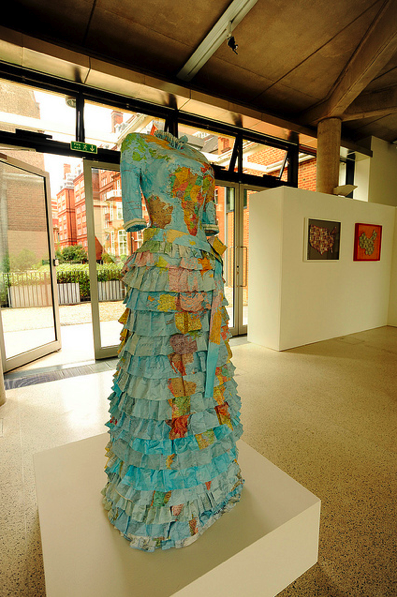 held at Somerset College in 2011, our exhibition here included the work of 35 textile artists reflecting on a variety of map themes. 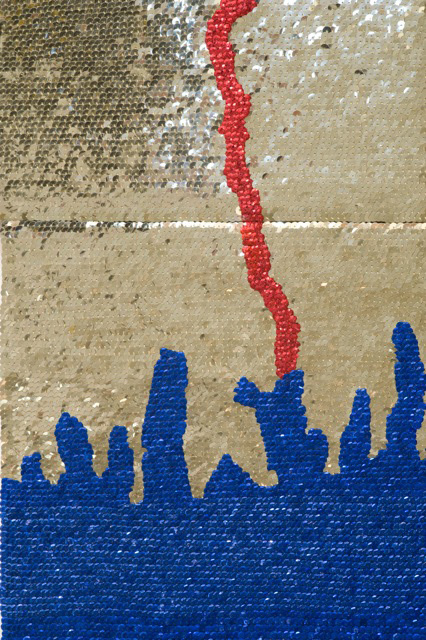 The artists utilized a range of experimental techniques, including delicate hand stitch, felt making, quilting, collage knitting, sculpture as well as digital media. Reviews of the show are posted at the exhibition site, along with descriptions of all the projects. There’s a catalogue too, as well as a DVD of the show. Joyce Kozloff: JEEZ, The Armory Show Modern, New York, 2012. 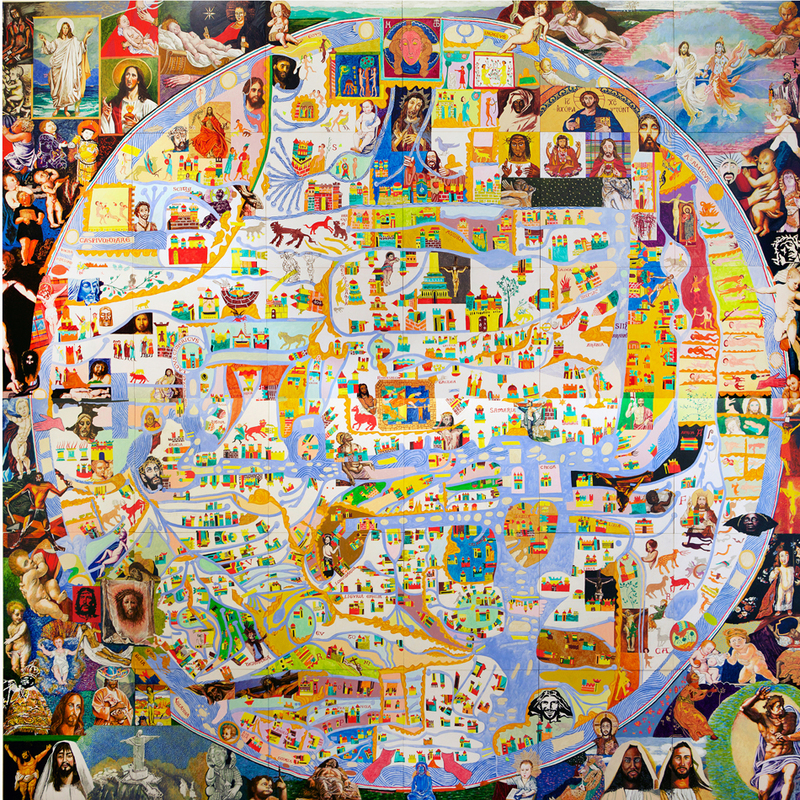 About JEEZ, which hung at the main entrance of the 2012 Armory Show Modern in New York, Kozloff has said, “JEEZ is my election year piece, a 12’ x 12’ painting based on the Ebstorf map, a 13th century mappa mundi, which depicted Biblical stories and pagan myths within the world as it was then known, with Christ’s body as a symbolic and literal frame. I have inserted and rendered 125 images of Jesus from the history of art and worldwide popular culture – black, Latino, female, Asian; adults and babies; gay and straight; images from the movies and New Age hippies off the Internet – each true to its artistic ideal. As the archetypes and stereotypes accumulate, holy portraits are transformed into a rogue’s gallery of mismatched characters. Seen altogether, this proliferation wryly erodes their power.” Kozloff’s work was also included in a number of the other exhibitions noted here, in exhibitions at D. C. Moore in New York, and elsewhere. Atlas critique, Parc Saint Léger, Contemporary Art Centre, Pougues-les-Eaux, France, 2012. The curators of this very interesting show wrote: “Although we are aware of the extent to which cartography as a discipline has been profoundly imbricated in the performative production of the narratives of modernity, in objective and positivist rationality, but also the history of colonialism and nationalistic constructions, for artists today, it has become a privileged site for the invention of counter-practices that open up new perspectives and participate in a deconstruction of hegemonies and post-colonial epistemologies as alternative tools for the production of knowledges, narratives and realities.” In demonstration of this they showed the work of, Francis Alÿs, Erick Beltrán, Berger & Berger, Border Art Workshop [a San Diego-based collaborative], Mark Boulos, Lewis Carroll / Henry Holiday, Chto delat? [a Russian art collective], Fernand Deligny, Michael Druks, Claire Fontaine, Internacional Errorista [an international art movement], Pedro Lasch, Vincent Meessen, Nástio Mosquito, Estefanía Peñafiel Loaiza, Lia Perjovschi, Radek Community+Dmitri Gutov [Moscow-based group], Philippe Rekacewicz, R.E.P. Group [a Ukrainian art collective], Allan Sekula & Noël Burch, Société Réaliste [a Parisian cooperative], Stalker [a walking group based in Rome], Endre Tót, David Wojnarowicz / James Wentzy / AIDS Community Television. This was an amazing exhibition, accompanied by conferences, performances, and films. 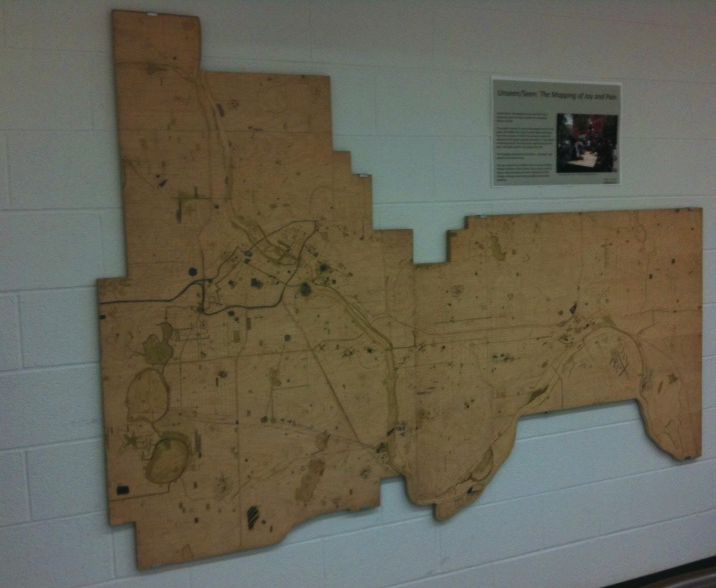 The Map as Art, Kemper Museum. St. Louis, Missouri, 2013. Inspired by Katharine Harmon’s best-selling book, The Map as Art, this exhibition presented work that explored the issue of mapping – whether conceptually or quite literally – while examining systems of personal gesture involved in large-scale works. The exhibition featured more than 30 works by seven artists: Ingrid Calame, Nathan Carter, Tiffany Chung, Joyce Kozloff, Lordy Rodriguez, Robert Walden, and Heidi Whitman, several of whom made presentations in the extensive programming that accompanied the show. It was co-curated by Kemper Museum curator Barbara O’Brien and Katharine Harmon. There was an illustrated gallery card. Sept 14, 2012-April 21, 2013. MAPPAMUNDI, art et cartographie, Hôtel des Arts, Centre d’art du Conseil général du Var, Toulon, 2013. Less pretentious than some shows, but more exciting, MAPPAMUNDI brought together 58 works by 26 artists, a number of them represented in Atlas critique (for example, Stalker) and/or Contemporary Cartographies: Drawing Thought (for example, Kuitca) in a show organized by Guillaume Monsaingeon around three themes: the body, combat, and the tale. Monsaingeon also wrote the fully-illustrated, 190-page catalogue, MAPPAMUNDI, art et cartographie, which opens with a long history of maps and map art. The exhibition included Céline Boyer’s project Empreintes, a collection of photographs of hands, against black backgrounds, on which maps of their places of origin (Senegal, Iran, Spain, and so on) have been superimposed. 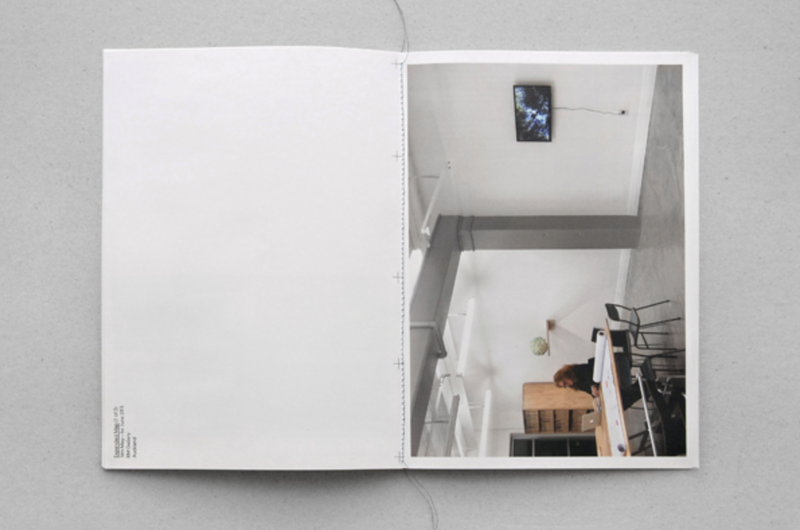 A 100-page book – all of which fold out – documents Empreintes. Boyer’s project is connected to those in the exhibition of Qin Ga and Kuitca, though indeed this show was rich in resonances. Expanded Map, RM Gallery, Auckland, New Zealand, 2013. Curated by Ruth Watson and James Wylie, who both co-authored the catalogue and have pieces in the show, Expanded Map is an artists show in an artists space. 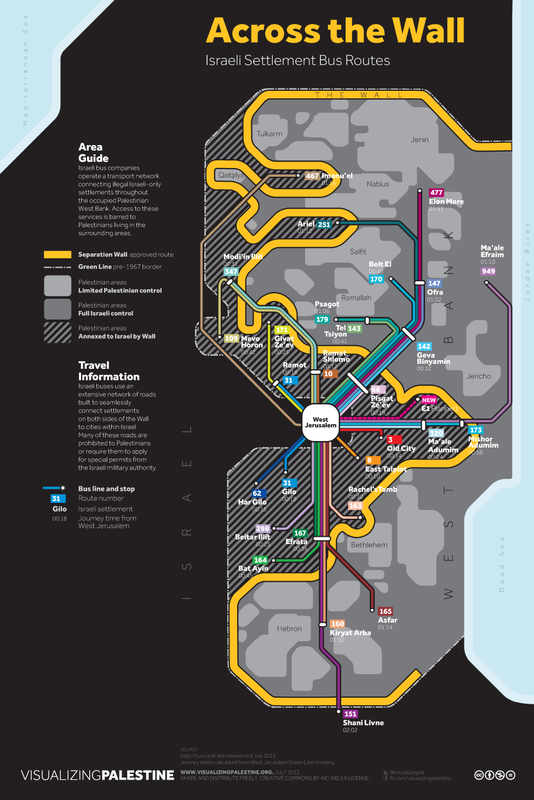 With the exception of Gigi Scaria, Lize Mogel, and Clare Noonan all the artists are locals: Auckland has a rich map art scene! The show was divided into two parts, both of them covered in the color catalogue. Universe, The Sculpture Center, Cleveland, Ohio, 2013. Mark Schatz mapped the world in this sprawling, double-sided landscape model built with ideas from architects, planners, hobbyists, and self-taught artists,. The faceted map could be folded up to make a Buckminster Fuller-inspired cuboctohedron; and it drew attention to individual perceptions of ones place, ones residence or “home,” and how it’s all a multifaceted, living, growing experience. 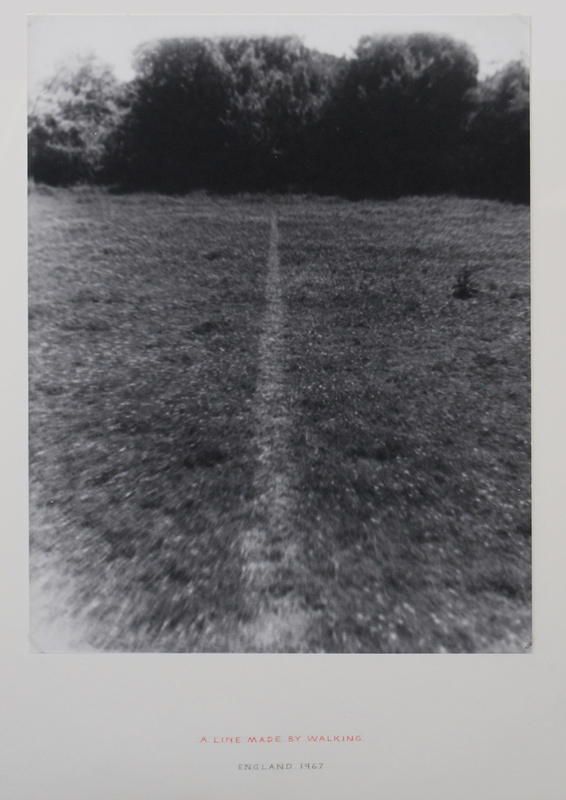 Artists’ Walks: The Persistence of Peripateticism, Dorsky Gallery, New York, 2013. 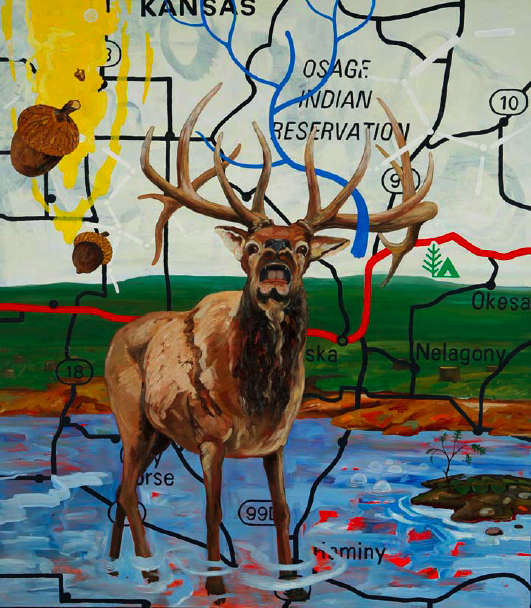 Curated by Earl Miller, this is an example of a show tangential to the world of map art, but in an essential way, for walking, after all was for most of human history how we came to know the world. A lot of peripatetic art still uses maps to document the walks. Here this was the case for the work of Danica Phelps, Gwen MacGregor, and Sandra Rechico. The latter two also organized a piece, “Map It Out (New York),” in which they invited people to map the travels they’d made during the day, and then they assembled the collected drawings into a psychogeographic portrait of New York that hung alongside works by Richard Long, Hamish Fulton, and others. Neat show. From Memory: Draw a Map of the United States, Sean Kelly Gallery, New York, 2013. This show is the first presentation of a project conceived and produced in 1971-1972 by Hisachika Takahashi. 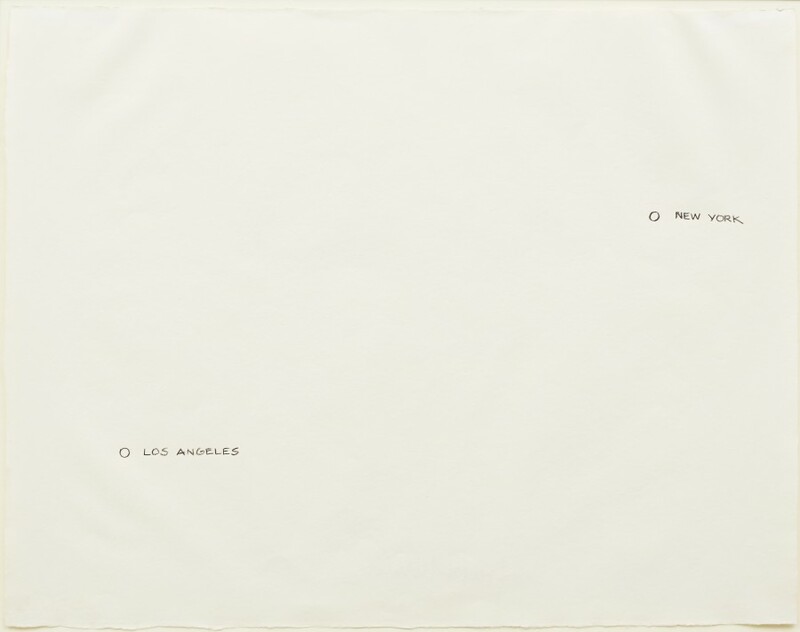 Takahashi, a Japanese artist living in New York, asked twenty-two fellow artists to each draw or paint a map of the United States entirely from memory on the handmade Japanese paper he provided: Arakawa, Jed Bark, Mel Bochner, Juan Downey, Alex Hay, Jasper Johns, Joseph Kosuth, Jeffrey Lew, Jane Logemann, Brice Marden, Gordon Matta-Clark, Richard Nonas, Robert Petersen, Robert Rauschenberg, Dorothea Rockburne, James Rosenquist, Keith Sonnier, Hisachika Takahashi, Cy Twombly, Susan Weil, Lawrence Weiner, Robert Whitman and Don Wyman. It’s a valuable document of the scene and of the map ferment beginning to grip the art world. Lines of Control: Partition as a Productive Space, Nasher Museum of Art, Duke University, Durham, North Carolina, 2013-14. This is another show at once tangential to map art and yet concerned with an essential map element: lines of control. The lines of control in this case are mostly borders through contested areas (India/Pakistan, Israel/Palestine, Mexico/US, and so on). Green Cardamom brought together more than thirty contemporary artists (from Francis Alÿs to Muhammad Zeeshan) and a host of other contributors (including Iftikhar Dadi and Irit Rogoff) to mount a ceaselessly stimulating exhibition, first in 2012 at Cornell and then in 2013-14 at Duke. It spawned a 240-page full-color catalogue. A great stimulating show and a terrific catalogue! Surveying the Terrain, Contemporary Art Museum, Raleigh, 2013-14. While Lines of Control was up at Duke in Durham, across the Triangle in Raleigh, CAM was showing Surveying the Terrain, another show tangential to map art, yet equally concerned with an essential subject; or, as the gallery brochure put it, “Surveying the Terrain explores contemporary artworks that map our terrain.” Curated by Dan Solomon, it featured ten artists including Alfredo Jaar, Laura Kurgan, Maya Lin, and Trevor Paglen. Beautiful work! MAPnificent! 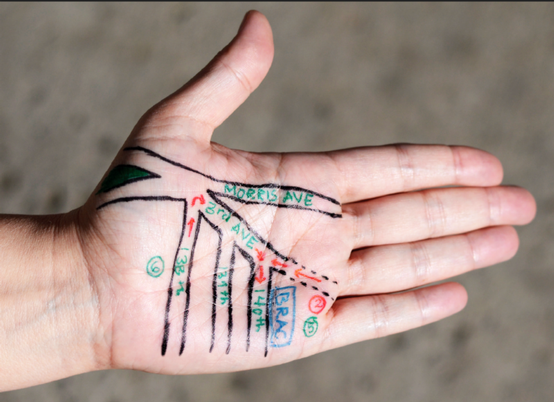 Artists Use Maps, Bronx River Art Center, New York, 2013-14. Curated by Yulia Tikhonova, this show’s 18 artists – among whom were Paula Scher and Mannahatta – approached the map from every direction. 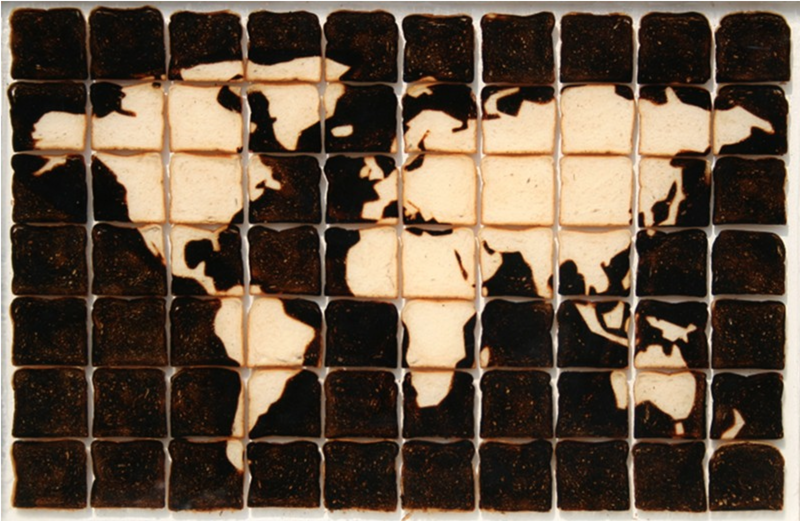 This may have been the year’s most classic map art show, a fading form. Unmapping the World, EXD’13 / Instituto de Investigação Científica Tropical, Palácio dos Condes da Calheta, Lisbon, Portugal, 2013. 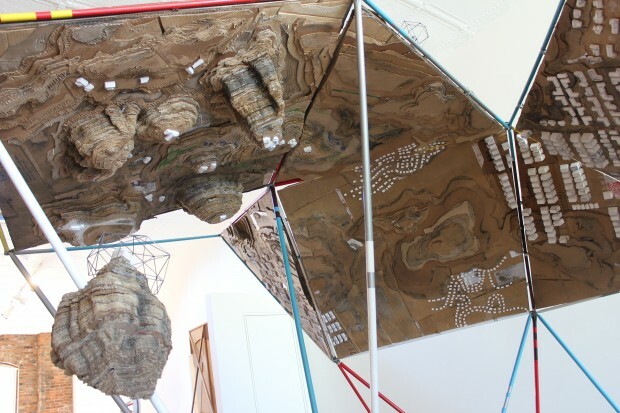 Part of Experimental International Design Biennial 2013, and curated by Annelids de Vet (of the Subjective Atlas of … fame) and Nuno Coelho, the exhibit was “an exploration into the field of reactive map making practices. It aims to counterpoise the apparent neutrality of professional cartography through contemporary engaged mapping projects. In this exhibition, ways of mapping are used to resist the authority of state, to question ruling power structures and to expose the propensity of maps to simplify our world. The act of uncapping is presented as a poetic form of resistance.” And so much more! The Cartography of the Unseen, The Research Gallery, Holon Institute of Technology, Holon, Israel, 2013. This exhibition dealt with “the political reading of the overt and covert mechanisms embedded in the act of cartography, by exposing the ideological aspects, as well as the solicitation to action performed through mapping. The exhibition analyses the ways in which the design of maps conditions the very interpretation of them, and examines how the act of mapping affects the reorganization of the mapped territory.” Thirteen projects from as many territories were presented, including work from both Israel and Palestine. Radical presentation! From the Uneven Geographies Show at Nottingham Contemporary. 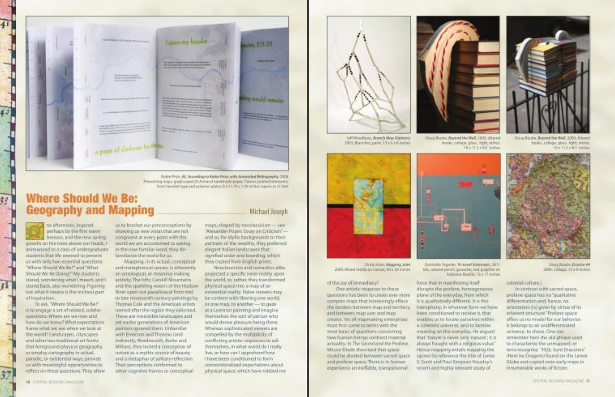 Denis Wood’s 2010 book Rethinking the Power of Maps includes a discussion of exhibits devoted to maps created by artists prior to 2010. A significant number of exhibits have opened since the book was published, and Denis supplies an update below. Long before the emergence of critical cartography in the 1980s (at the hands of Fels and Wood, Harley, Rundstrom, Pickles, etc. ), artists had been critiquing the map from every conceivable perspective. In 1929, for example, Paul Éluard edited the world map to better conform to notions of Surrealist desire; in 1943 Joaquín Torres-García turned it upside down to make it better accord with South American points of view; in 1960 Jasper Johns slathered oil paint all over the map’s pretensions to accuracy and precision; in 1966 Claes Oldenburg blew the map off the page by stuffing it with kapok; in 1969 John Baldessari literalized map type by photographing on the ground the letters C, A, L, I F, O, R, N, I, and A where they appeared on a state map; in 1971 Alighiero Boetti embroidered the map’s servitude to the state in national flags, again and again. 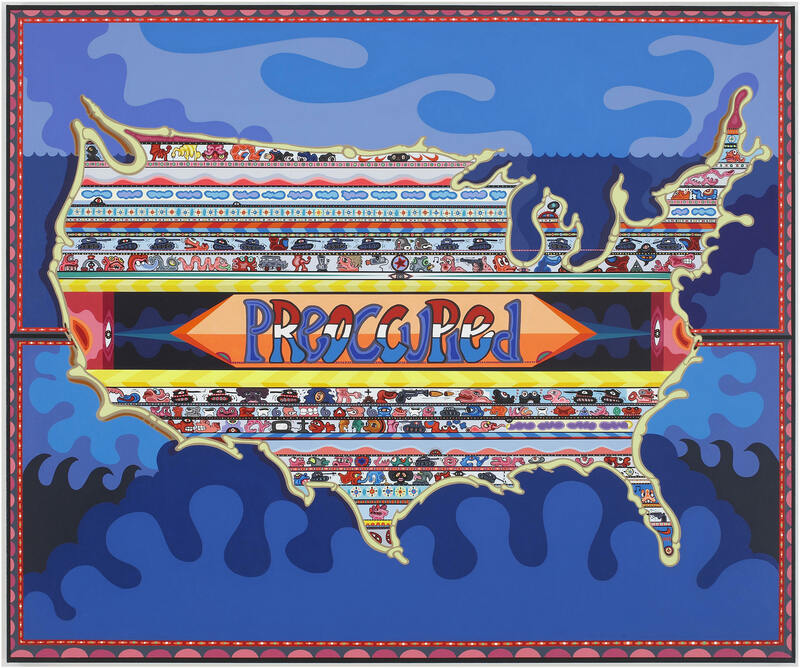 Artists attacked the map, mocked it, contested it, made fun of it, turned it into a joke, emptied it of meaning, erased it, distorted it, reconstructed it, and in the process revealed it for what it was, a human artifact – like a magazine advertisement for Cadillac or a billboard for Luck Strikes – albeit one with legal pretensions in the domain of borders (from national borders all the way down to those of private property). By the time the 1980s rolled around map art was a rapidly growing phenomenon. 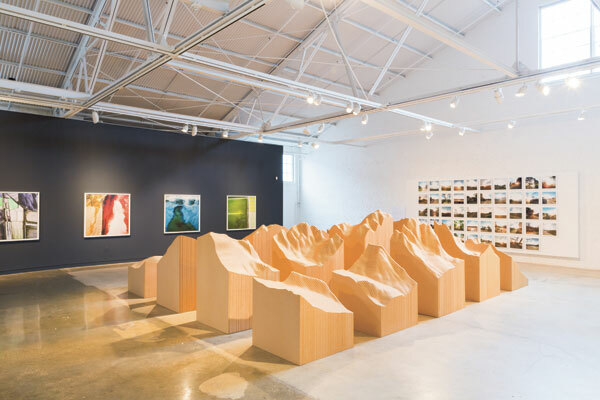 One index to this was the ever-growing numbers of group shows devoted to map art and what follows is a catalogue of the 2010-2011 map art shows that have come to our attention (thanks to the sharp eyes of Lize Mogel and kanarinka especially). We’re certain there were more and beg you to note them in the comments. We’ll make certain to update the list. 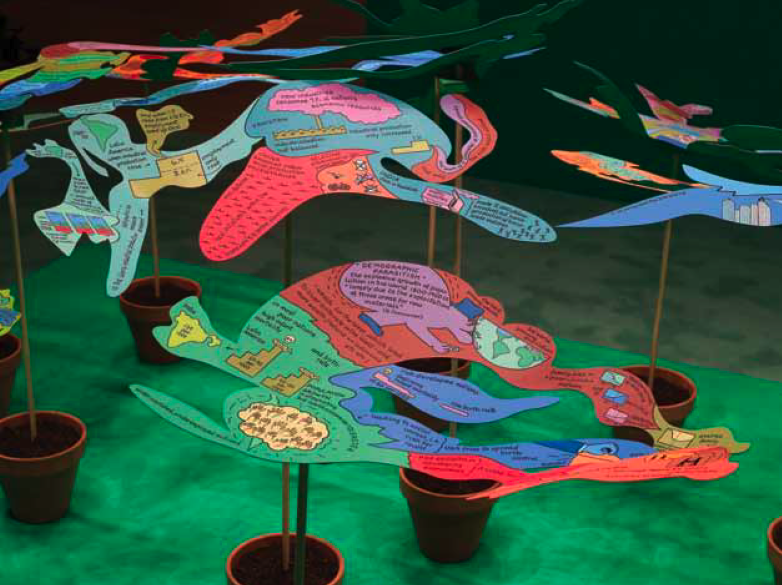 During the period Nato Thompson’s Experimental Geography exhibition continued to travel, as did Lize Mogel and Alexis Bhagat’s Atlas of Radical Cartography; and the intense activity finally drew the attention of Artnews which devoted two pages in its October, 2010 issue to map art. The piece not only covered Experimental Geography and the Atlas of Radical Cartography, but drew attention to Rebecca Solnit’s Infinite City: A San Francisco Atlas. Solnit and Denis Wood appeared together at the Los Angeles Times Festival of Books with her Infinite City and his Everything Sings: Maps for a Narrative Atlas (with an introduction by Ira Glass). A casual survey of the data suggests that Joyce Kozloff remains the most widely exhibited map artist but, especially with the continued travelling of Experimental Geography and the Atlas of Radical Cartography, Lize Mogel and Trevor Paglen are giving her a run for the money (artists whose work is more varied would be hard to imagine). 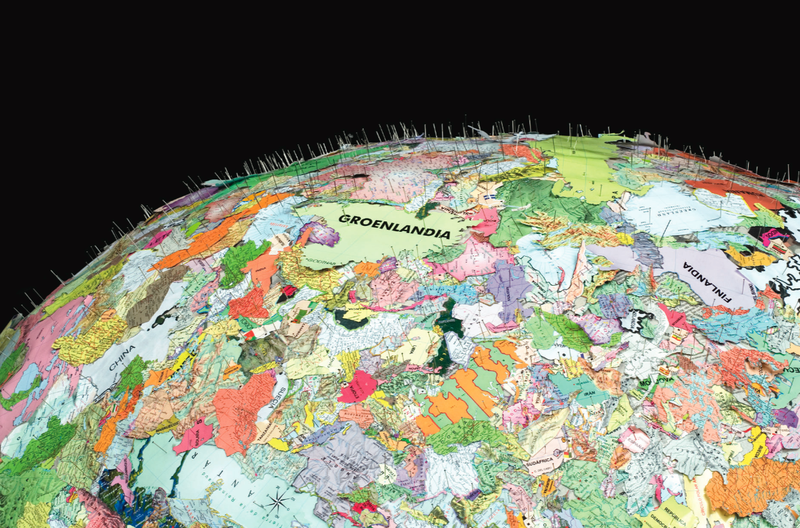 It’s worth noting that 2010 was a banner year for map art atlases too. The publication of Everything Sings was posted here at Makingmaps.net, but Rebecca Solnit’s celebrated Infitinte City: A San Francisco Atlas also needs to be mentioned, along with another, wholly different, San Francisco-map art atlas, Tracing the Portola: A San Francisco Neighborhood Atlas from, Kate Connell and Oscar Melara. Both Tracing the Portola and Infinite City were also released as broadside posters. Mapping Spectral Spaces, Virginia Tech College of Architecture and Urban Studies, Blacksburg (VA), 2010. “How have residual marks [including maps] been created, left, and remembered? How might we conceptualize these afterlives and effects of experiences, perceptions, processes, and events?” Curated by Deb Sim, the exhibition displayed the work of Chris Baeumler, Iain Biggs, Laurie Beth Clark, Gülgün Kayim, Rebecca Krinke, Mary Modeen, Mona Smith, Judith Tucker and Dane Webster. Download the 40-page, full-color catalogue at the web site. You Are Here: Mapping the Psychogeography of New York City, Pratt Manhattan Gallery, New York, 2010. This show, curated by You Are Here’s Katherine Harmon, wanted to “map the emotional terrain of the world’s most famous and influential urban center, New York City, and explore the effect of the city’s powerful moods on those who live and work here.” The show included Nicola Twilley’s Scratch ‘N Sniff NYC, Nina Katchadourian’s New York Soundtrack, Daniela Kostova and Olivia Robertson’s Anxiety Map, and Ingrid Burrington’s Loneliness Map, among others. 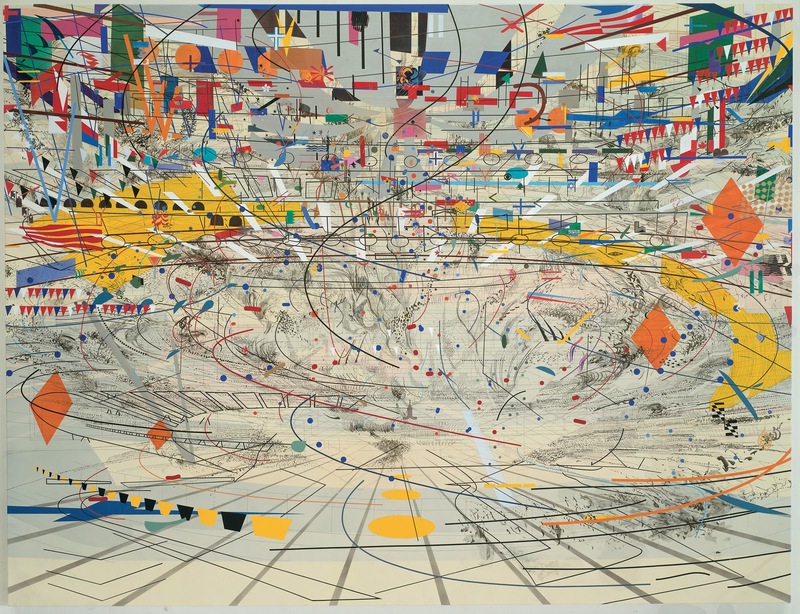 Julie Mehretu: Grey Area, Guggenheim Museum, New York, 2010. “Asking what it means to be an American artist in Germany during the Iraq and Afghanistan wars of the Bush years, Mehretu’s canvases meditate on the idea of the modern ruin,” in “maplike networks” of lines evoking trade routes and shapes drawn from architectural plans, city plans, and aerial imagery. The show is accompanied by a richly illustrated catalogue. Mapping: Outside/Inside, Borowsky Gallery (Gershman Y), Philadelphia, 2010. “Four artists who use maps to bend our understanding of the outside world, including Leila Daw, Joyce Kozloff, Eve Andree Laramee, and Nikolas Schiller.” The show seems to have been curated by Schiller. No catalogue. MarieE posted shots of the show at the URL above. Creative Compass, Royal Geographical Society, London, 2010. Maps from the Society’s collection together with newly commissioned map art from Agnès Poitevin-Navarre and Susan Stockwell. It was accompanied by a 32-page illustrated color catalogue, with an essay by Dr Harriet Hawkins and artist interviews by Paul Goodwin. There’s a slide show at the URL above. 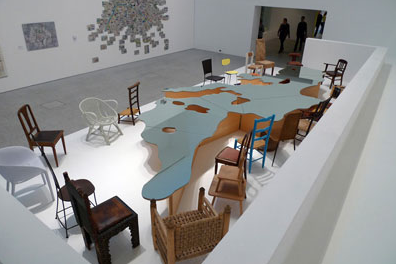 Uneven Geographies, Nottingham Contemporary, Nottingham, 2010. “Uneven Geographies considers ways contemporary art responds to the politics of globalization through the work of fourteen artists and artist-collectives from twelve countries and five continents.” The artists are: Éduardo Abaroa, Azzellini & Ressler, Yto Barrada, Ursula Biemann, Bureau d’Études, Öyvind Fahlström, Goldin + Senneby, Mark Lombardi, Steve McQueen, Cildo Meireles, George Osodi, Bruno Serralongue, Mladen Stilinović, and Yang Zhenzhong. The 62-page catalogue is available as a download at the URL above. 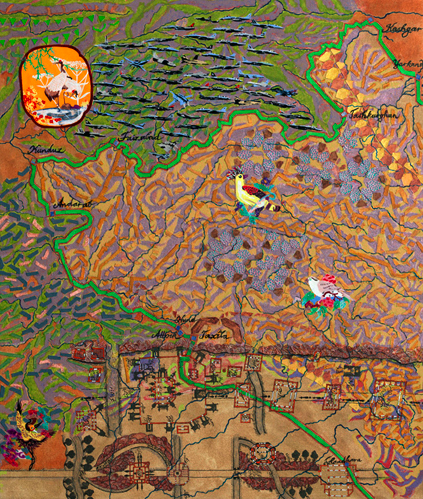 Joyce Kozloff: Navigational Triangles, DC Moore, New York, 2010. “Long before Google Maps or GPS, seafarers used navigational triangles to pinpoint their location and to chart their course in relation to celestial bodies and the earth’s poles. 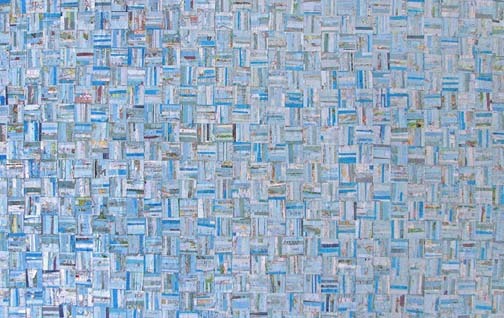 This exhibition comprises paintings and mixed media works that expand upon this concept and continue the artist’s longstanding engagement with cross-cultural issues.” The show also included pieces from Kozloff’s newest series, China Is Near (Charta, Milan, 2010, with an essay by Barbara Pollack). 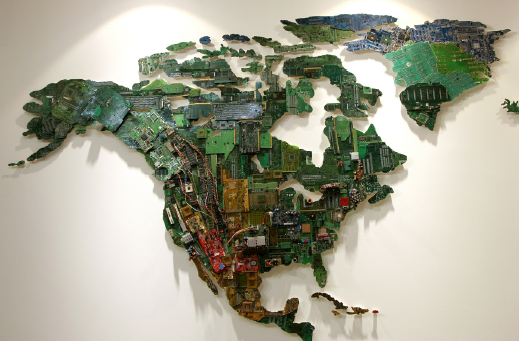 Mapworks: the Map as Art, Sebastopol Center for the Arts, Sebastopol (CA), 2010. Juried by Kim Anno the show included work from Michael Acker, Brian Andrews, Marla Brill, Stephanie Hamilton, Lee Millard, Michele Morehouse, Tofu S, Kathleen Yorba and others. No catalogue. 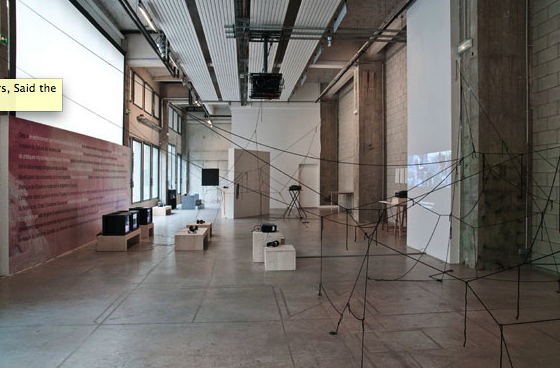 We Don’t Record Flowers, Said the Cartographer, Bétonsalon, Paris, 2010-2011. Put together by bo-ring (Virginie Bobin and Julia Kläring), the show “takes roots in the appropriation – under various forms and for various reasons – of the desert and its images in modern and postmodern political and cultural history,” that desert, which is “whiteness ‘without qualities’ – or so it is fantasized – and is best captured with maps or planar representations. 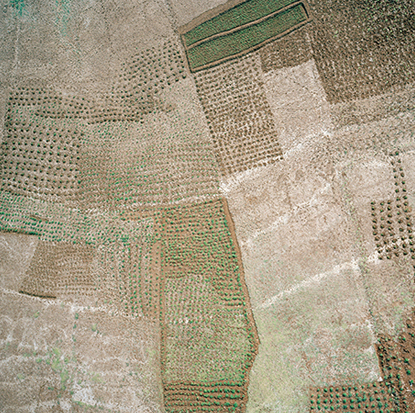 It is thus an ideal space for projection, inscription, and the forward planning of political fantasies, architectural utopias, scientific expeditions, and some of fiction’s founding narratives.” It included the work of Lara Almarcegui, Louidgi Beltrame, Ursula Biemann, Julien Blanpied, Wang Bing, Tacita Dean, Ellie Ga, Michael Höpfner, Ruth Kaaserer, Yves Mettler, Trevor Paglen, Carson Salter, le Silo, Triple Canopy et José León Cerrillo, and was accompanied by a full slate of programs. There’s plenty more at the URL above, where you can follow the links to a catalogue site where you can assemble your own catalogue of well over a hundred pages. 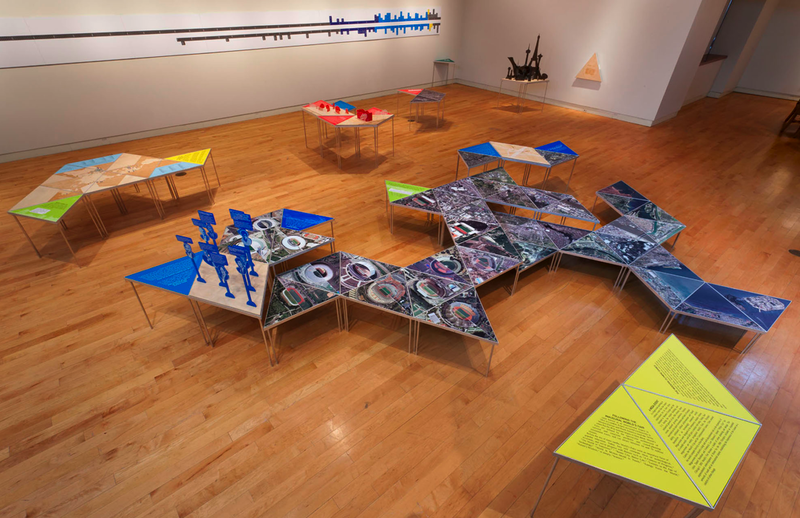 Mapping: Memory and Motion in Contemporary Art, Katonah Museum of Art, Katonah (NY), 2010-2011. 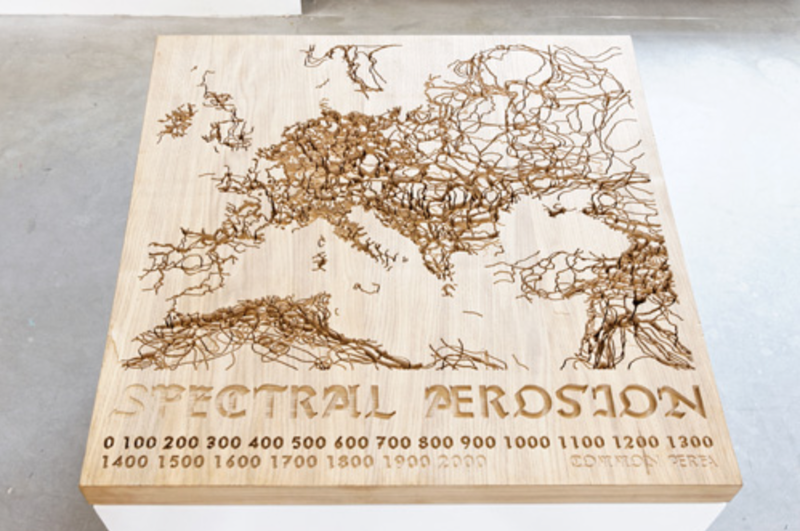 “In an era of global culture, artists are increasingly exploring maps as both image and cipher. Mapping: Memory and Motion in Contemporary Art features paintings, works on paper, sculptures, videos, a sound installation, and a live web terminal to address such themes as borders and boundaries, identity and colonialism, journeys – both real and imagined, memory and nostalgia, and tourism and travel.” Curated by Sarah Yanguy, the show included the work of 38 artists and was accompanied by a lovely, 52-page, full-color catalogue. You can download a teacher’s pre-visit pack at the URL above. Apamar. Charts, metrics and politics of space, Centre d’Arts Contemporàbies, Barcelona, 2010-2011. “The projects intersect through proposing alternatives to the representation of space, its interpretation and how to live in it,” and “In this sense, Beirut: Mapping Security by Mona Fawaz, Ahmad Gharbieh and Mona Harb, depicts the numerous types of security measures that have been established in municipal Beirut as a result of the armed conflicts the country has witnessed since the 70s. Sara Nelson Wright’s visual mapping of six individuals’ travels in Brooklyn, Locations and Dislocation, is a reflection on the effects of gentrification and urban expansion. In LRPT (La región de los pantalones tranfronterizos), the Tijuana-based collective Torolab makes visible the transnational mobility of the inhabitants of the twin cities of Tijuana and San Diego. Isaki Lacuesta and Isa Campo visit Places that do not exist, and provide us with an account of the reality of these places that have disappeared from Google earth for being protected areas. Geografie dell’Oltrecittà and Agroculture nomadi of Stalker/Primavera Romana are common design projects that generate and share social knowledge and awareness on urban changes, while Guifi.net in Catalunya, Mapeo Colectivo from Iconoclasistas in Buenos Aires, and Mapping the Commons, Athens by Hackitectura.net all spur us into participation with the aim of creating common resources.” The extraordinary show was curated by Maral Mikirditsian, Ramon Parramon and Laia Sole. There’s more at the URL above. Raw: Geographies, Reed College Campus, Portland, 2011. “Seeking to transform our physical, social, and individual landscapes, RAW: GEOGRAPHIES explores and reconstructs our experience of space. Entering into the emerging discourse of experimental geographers, radical cartographers, old-school land artists, unruly activists, and stodgy theorists, it resides in the interdisciplinary space of psychogeography, spatial practice, environmentalism, and architecture. A heterogeneous mix of elements that shift pre-inscribed boundaries, RAW: GEOGRAPHIES will suspend the everyday in a space for potentiality and play.” The event showcased the work of Francis Alÿs, Lize Mogel, Melvin Edwards Nelson, Jacinda Russell & Nancy Douthey, Kathy Westwater, Gary Wiseman & Gabe Flores, and Ben Wolf. 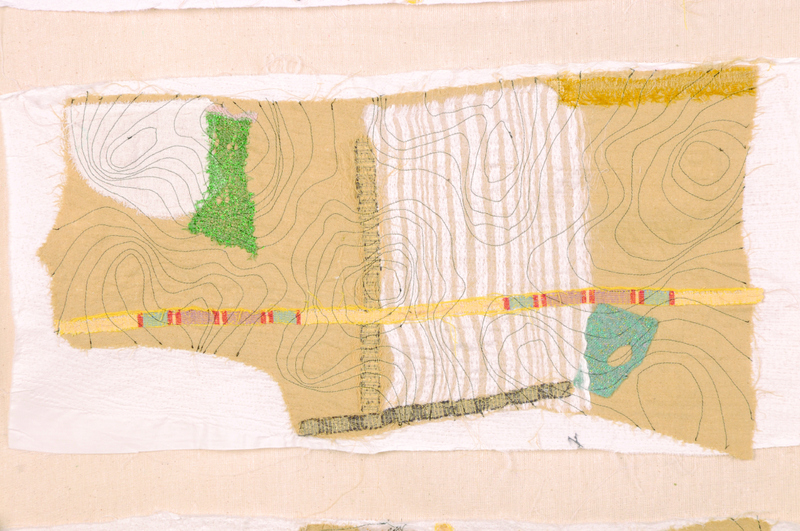 Mapping Joy and Pain, an ongoing project, mostly U.S. (Twin Cities, MN), 2010-2011. Rebecca Krinke’s public map art project consists of a large laser-cut map of Minneapolis and St. Paul (and elsewhere) on which people are encouraged to locate their personal places of joy and pain. Not quite the Atlas of Love and Hate Bill Bunge had in mind, it’s a serious step in that direction. 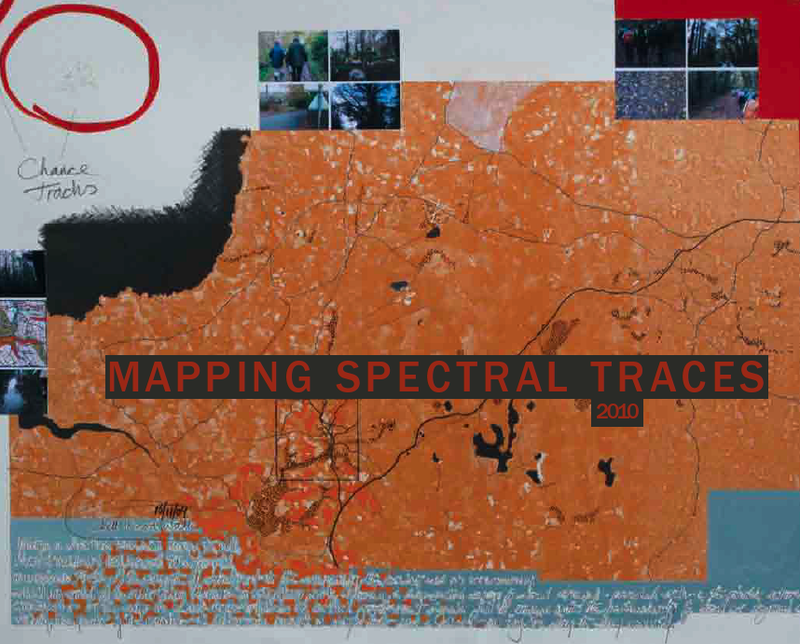 The map or its analogues have been widely displayed (for example, see Mapping Spectral Spaces above), but the home office, with numerous videos, downloadable pdfs, and so on, is at the URL above. 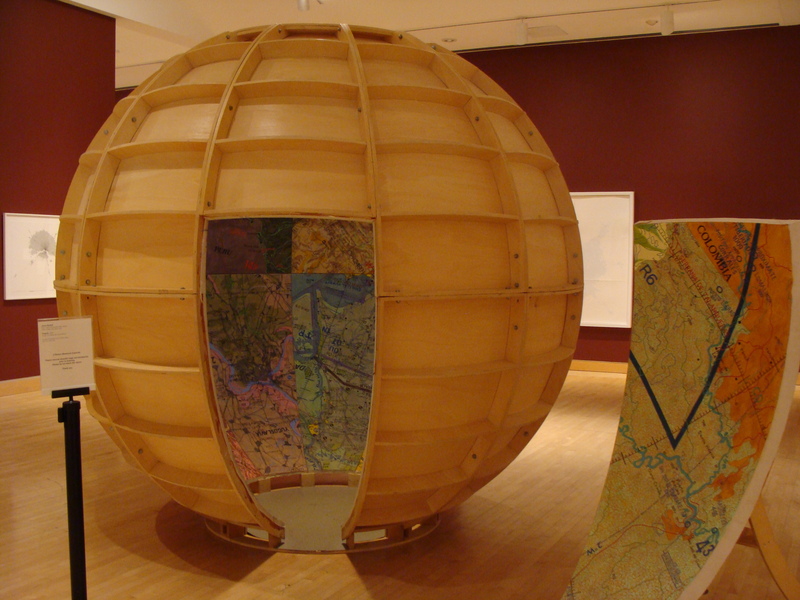 Mappamundi, an exhibition about maps and contemporary art, Berardo Museum-Foundation, Lisbon, 2011. Another extraordinary show! Curated by Guillaume Monsaingeon, the exhibition assembled an international group of artists who, over the past 40 years, have worked on maps and who have questioned cartographical representation. included the work of Noriko Ambe, Lars Arrhenius, Neal Beggs, Alighiero Boetti, Daniel Chust Peters, De Geuzen, Angela Detanico & Rafael Lain, Paola Di Beloo, Peter Fend, Jochen Gerner, Luigi Ghirri, Marco Godinho, Anawana Halba, Hong Hao, Nina Katchadourian, Chris Kenny, John Klima, Joseph Kosuth, Guillermo Kuitca, Nelson Leirner, Cristina Lucas, Mateo Mate, Satomi Matoba, Paco Mesa & Lola Marazuela, Matt Mullican, Rivane Neuenschwander, Miguel Palma, Michelangelo Pistoletto, Kathy Prendergast, Qin Ga, David Renaud, Rosana Ricalde, Susan Stockwell, Jeanne Terwen-de-Loos, Caterina Vaneetvelde, Adriana Varejao, Jessica Vaturi, Robert Walden, Jeremy Wood. See the slides at Jeremy Wood’s GPS Drawing website (above). The museum’s website is here. Mapping, Carroll Square Gallery, Washington, DC, 2011. The show featured the work of Carol Barton, Dahlia Elsayed, Joyce Kozloff, Siobhan Rigg, Juan Tejedor, and Renee van der Stelt. 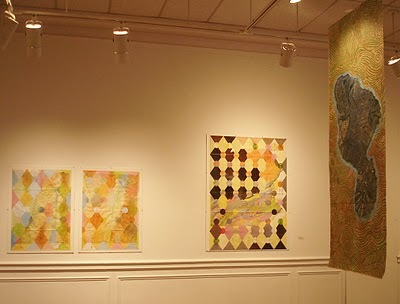 Lauren Rosenthal, Hand-Cut Paper, The Monmouth Museum (NJ), 2011. 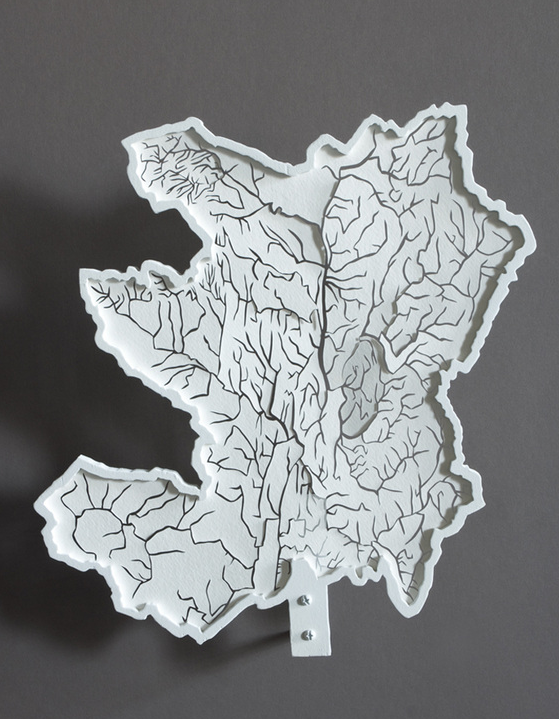 Rosenthal uses maps – here hand-cut paper maps of rivers and river basins – to reorient people’s thinking about rivers and our interconnectedness. Rosenthal’s river blog is here. 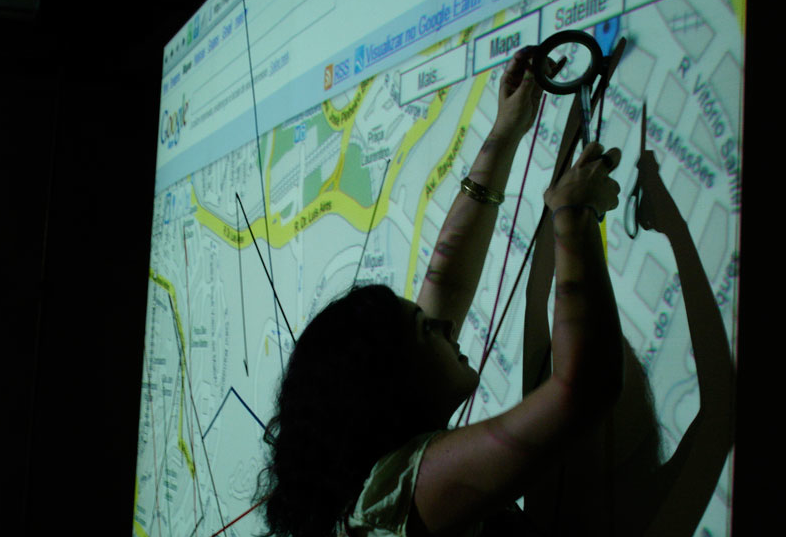 The Art of Mapping, TAG Fine Arts, London, 2011. The show “celebrates cartography’s potential as an art form, rather than a science,” and included the work of Neal Beggs, Claire Brewster, Christa Dichgans, Stanley Donwood, Peter Dykhuis, Dahlia Elsayed, Rob Good, Gonkar Gyatso, Emma Johnson, Jonathan Parsons, Simon Patterson, Nigel Peake, Grayson Perry, Rob Ryan, Paula Scher, Justine Smith, Susan Stockwell, Robert Walden, Stephen Walter, Heidi Whitman, Jeremy Wood, and Cai Yuan. A color catalogue accompanied the exhibition which can be downloaded here. Global Cities, Model Worlds, Pittsburgh Biennial, Pittsburgh, 2011. Co-organized by the Carnegie Museum of Art, Miller Gallery at Carnegie Mellon University, Pittsburgh Filmmakers/Pittsburgh Center for the Arts (PF/PCA), and The Andy Warhol Museum; and organized by Astria Suparak; the exhibition featured the work of Justseeds, Lize Mogel, Sarah Ross & Ryan Griffis, subRose, Temporary Services, and Transformazium. Mind the Map! Barents Spektakel, Kirkenes, Norway, 2011. “The Arctic map is changing – creating new stories, opportunities and challenges. The Arctic map is being redrawn today. Who controls the Arctic seabed? More and more stakeholders ‘update’ their claims for the Arctic pie.” Involving commissioned music, writers, and others, the Speektakel’s Pikene på Broen invited three artists to comment on these issues: Morten Traavik (Norway), Olga Kisseleva (Russia), and Stefano Cagol (Italy). Mapping the Surface, Central Booking, New York, 2011-2012. “Cartographers can tell us more than just the routes from one point to another, they can map terrains of landscape or psychological space, that amorphous state that adds up to a sense of a place beyond mere cataloging. They can also reduce all to the basic, the pure essence of line and plane. These artists in the next exhibition at CENTRAL BOOKING take us along such a road and beyond”: Doug Beube, Jeff Woodbury, Christina Mitrentse, Heidi Neilson, Robin Price, Cindy Kane, Dannielle Tegeder, Haptic Lab, Paula Scher, Alastair Noble Lilla LoCurto & Bill Outcault, Sabra Booth, Public Laboratory, Smudge Studio (Jamie Kruse and Elizabeth Ellsworth), Robbin Ami Silverberg, Barbara Siegel, and Elena Costelian. A catalog of Mapping the Surface is available as part of the November issue of CENTRAL BOOKING Magazine, at the URL above.